In order for a spark plug to work as it should, the gap between the ground and centre electrodes needs to be perfectly calibrated. By adjusting this distance you are sad to be ‘gapping your spark plugs’. With the aid of a feeler gauge and the following advice, this adjustment is certainly something that you can do yourself. What are the conventional spark plug gap settings? These figures are for guidance only and may vary on certain engines. Consult a recommendation list or vehicle manufacturer's handbook for individual gap settings. The rule of thumb for the spark plug gap on older engines is coil ignition 0.025 thou and magneto ignition 0.018 - 0.020 thou. Spark plugs are typically designed to have a spark gap which can be adjusted by the technician installing the spark plug, by the simple method of bending the ground electrode slightly to bring it closer to or further from the center electrode. Do you need to adjust the gap settings of a new spark plug? The belief that plugs are properly gapped as delivered in their box from the factory is only partially true, as proven by the fact that the same plug may be specified for several different engines. Each engine will actual require a different gap. Whether or not you need to make an adjustment will depend on the engine. New spark plugs might be pre-gapped for a V-8 engine, allowing you to install all 8 plugs unchanged. However, if installed in a 6-cylinder engine, all 6 plugs would require re-gapping. If you’re in the market for a new or used spark plug, check out our spark plug buying guide today to determine the best product for your engine. What is a spark plug gap feeler gauge? A spark plug gap gauge is a disc with a sloping edge, or with round wires of precise diameters. It is used to measure the length of the gap between the ground and central electrodes. 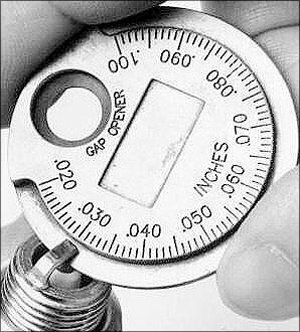 The simplest gauges are a collection of keys of various thicknesses which match the desired gaps. You simply need to keep making adjustments until the key fits snugly. 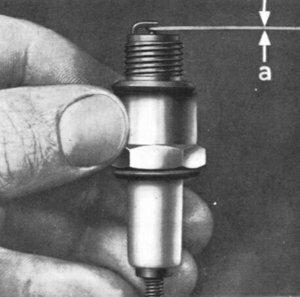 With current engine technology, universally incorporating solid state ignitions and computerised fuel injection, the gaps used are much larger than in the era of carburetors and breaker point distributors, to the extent that spark plug gauges from that era are much too small for measuring the gaps of current cars. The gap adjustment can be fairly critical, and if it is maladjusted the engine may run badly, or not at all. A narrow gap may give too small and weak a spark to effectively ignite the fuel-air mixture, while a gap that is too wide might prevent a spark from firing at all. Either way, a spark which only intermittently fails to ignite the fuel-air mixture may not be noticeable directly, but will show up as a reduction in the engine's power and fuel efficiency. This is why you should make a point of checking your spark plugs roughly every 30,000 miles, even if you’ve chosen an extended-life version. Prior to adjusting your spark plug gap settings, double check that it is clean. This is of particular importance when using pre-owned spark plug, a common occurrence with vintage and classic engines. You want to avoid introducing any debris to the engine’s combustion chamber or risk having dirt weaken the power of the ignition spark. We recommend using a wire brush and gentle motions. With the spark plug ready and prepared, it’s time to use the feeler gauge to determine whether an adjustment is required and how by how much. Refer to the manufacturer’s handbook for the correct figure and select it on the feeler gauge. Run the gauge between the ground and central electrodes. If it can’t pass through the gap or does so without touching both electrodes, the gap needs adjusting. To adjust the gap distance, simply bend the ground electrode towards or further away from the centre electrode. You might need to do so against a flat surface and it could take a couple of attempts to get the distance as you’d like. What are the main issues with spark plug gap settings? wide-gap benefit: spark is strong for a clean burn. A properly gapped plug will be wide enough to burn hot, but not so wide that it skips or misses at high speeds, causing that cylinder to drag, or the engine to begin to rattle. If a spark plug has eroded you’ll note how the center electrode (dark bump) had been a cylindrical rod, and the top ground electrode (like a claw) formerly had square edges. As a plug ages, and the metal of both the tip and hook erode, the gap will tend to widen. Therefore, experienced mechanics often set the gap on new plugs at the engine manufacturer's minimum recommended gap, rather than in the center of the specified acceptable range, to ensure longer life between plug changes. On the other hand, a larger gap gives a "hotter" or "fatter" spark and more reliable ignition of the fuel-air mixture. In addition, a new plug with sharp edges on the center electrode will spark more reliably than an older, eroded plug. As a result, experienced mechanics also realise that the maximum gap specified by the engine manufacturer is the largest which will spark reliably even with old plugs and will in fact be a bit narrower than necessary to ensure sparking with new plugs. Subsequently, it is possible to set the plugs to an extremely wide gap for more reliable ignition in high performance applications, at the cost of having to replace or re-gap the plugs much more frequently, as soon as the tip begins to erode.